Optical Collimator System W420-3 is designed for checking Automatic Level, Optical Theodolites, Electronic Theodolites, Total Stations and other Optical Levels. 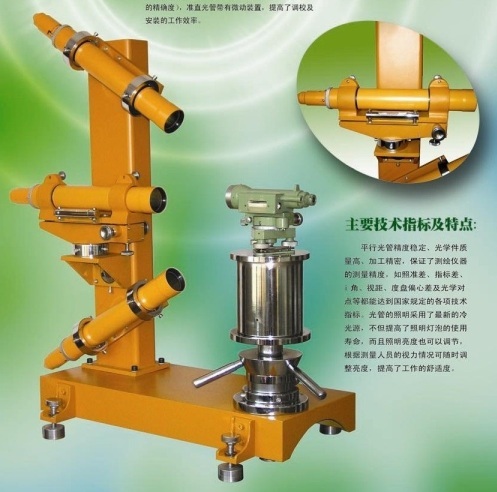 1.1This model of equipment adopts totally 3 collimator tubes which have the focus of 550 and been designed with plunge angle and collimation horizontal angle. 1.2The collimator tube is equipped with a reticle with the precision 30", which can significantly improve the inspection precision. customers’ usage, installation, commissioning and inspection. tuned according to customers’ requirements and indoor luminance. The source produces viridescent lights, which are comfortable for seeing. stably, and with different configuration, enables customers to operate readily and easily. 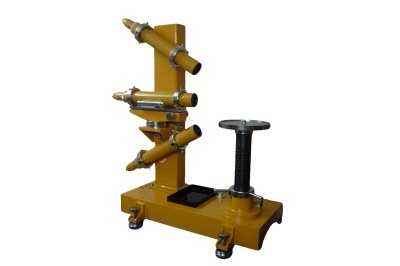 1.6The foundation is designed and installed with 4 leveling wheel, and at the bottom, 4 round pads can increase the ground force-carrying surface and the stability. The whole platform is available for leveling and moving.